After a few nights at The Backpack (hostel), I switched over to staying with Hannes, who agreed to host me via Couchsurfing. I was lucky enough to not only hang out with him a few nights, but to also have the chance to spend a few extra nights with the woman I sat next to on my Doha to Cape Town flight. 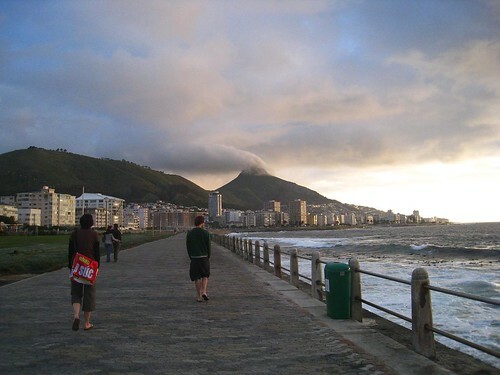 In the photo above, we're taking a sunset walk along a promenade; clouds just barely cover the top of Lion's Head mountain in the distance, which we would eventually climb together during sunrise one morning. Security Concerns – I almost got my pocket picked in broad daylight on a busy sidewalk. Great sunset picture. It looks so lovely especially hoe the clouds slightly cover the top of the mountain. What a beautiful site..you’re just a lucky dude to be at some wonderful site in this polluted universe. Great shot, looks peaceful. I thought it was a volcano at first. Thanks Matt, it can be fun to watch the clouds pass over all the mountains in and around Cape Town. Great site you have…makes me want to pack my bags and leave now! I was wondering if you know of any couch surfers from South Africa. I am doing a school assignment on couch surfing and would really appreciate your help, or any any one else’s if possible. Hi Nolwazi, I’d suggest signing up for Couchsurfing if you don’t already belong, and look to see if there is a group for South Africa, Cape Town or any of the other towns. If yes, post your message there. If not, try emailing a few South Africans for help. Good luck!